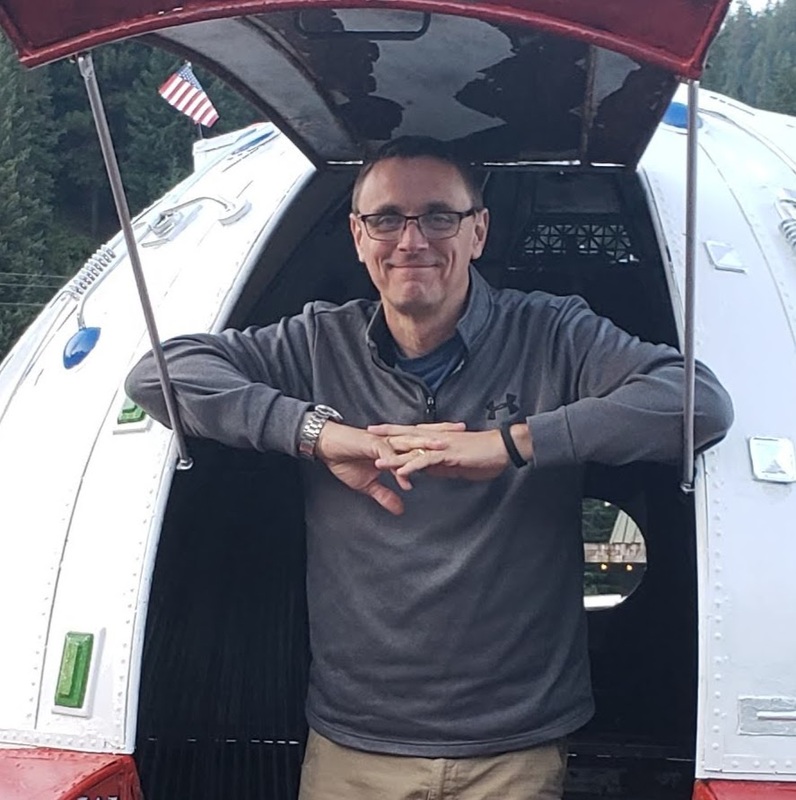 Those of you who follow this blog, that would be you and you, over there; know that I prefer to use Linux over Windows and Mac operating systems. I’m not alone. Other writer types use Linux, or so I’m told. But we are a rare breed of writer, to say the least. My preferred distribution of Linux for the past half decade has been Ubuntu. Ubuntu have impressed me over the years with their ability to innovate and bring desktop Linux to a place where anyone can now use it. I rarely have issues with using the OS myself and I’ve gotten to the point where my tolerance for tweaking is lower than ever. I just want my OS to work and get out of my way. At the same time, I’m willing enough to give innovative new features a fair shake to decide whether I like them or not. Ubuntu has been doing a fair bit of innovating lately with Unity. Many users either turned off the feature or left the distro for more traditional versions of Linux and that’s their option. But loyal Ubuntu users have doubled down and learned the new system, sometimes offering suggestions for improving it. With this latest version of Ubuntu I think we can say that Unity is pretty well polished and integrated. I’m no longer concerned with that aspect of the OS. It’s fine. The fit and finish of this release is at an all time high. Sure there are little things if you look for them, but you could say that about any OS. For the most part, Ubuntu looks great now and works great too. Job well done by the developers, testers! My primary writing laptop is an old white MacBook. Apple no longer supports it and refuses to let me upgrade to Lion. Although the hardware is starting to slowly fall apart in places, the little bugger keeps on ticking. So to help extend it’s life even further, I split the hard drive in half and installed the latest Ubuntu on it. Ever since I did this, I’ve been living in Ubuntu land and have never once booted back into Mac for anything. The 12.4 release of Ubuntu has awesome support for Mac hardware and it runs great on my laptop. I hope that when my MacBook dies, this support is also lauded on the new HP Folio 13, the next laptop in my future. Here are some screenshots of my desktop under the new Ubuntu. Shown are some of the programs I use on a regular basis. All of them seem to work just fine a week into using the new release. 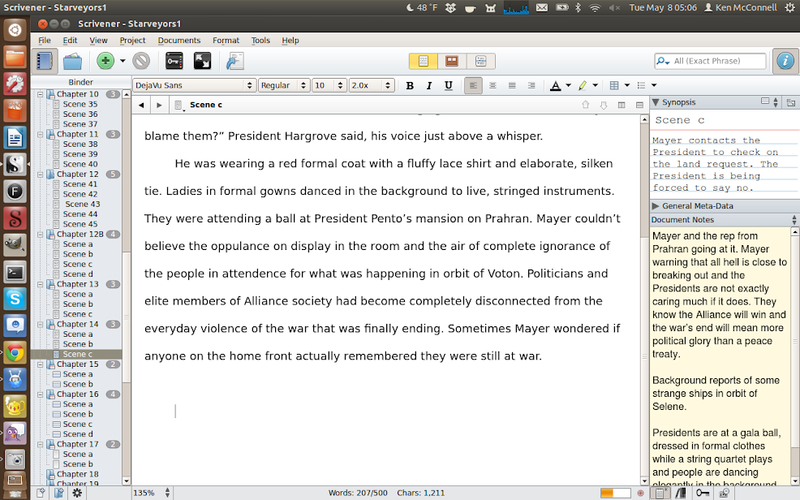 The top screenshot shows Scrivener running on an older monitor. Notice that the Unity buttons are huge. When you run it on the laptop, the resolution on my MacBook is good enough to allow for the option to shrink the Unity buttons. The result is much more pleasant and gives you more screen real-estate. 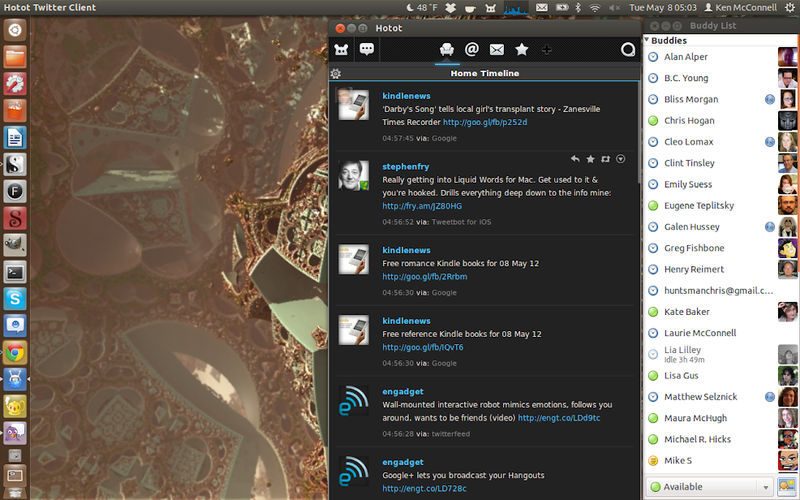 This screenshot shows the Twitter client Hotot and the old faithful chat client – Pidgin. Which I much prefer over the default chat client. This shows my default browser – Chrome. As you can see, when I run it full screen, it pretty much gives me all kinds of real-estate. I like Chrome better on Linux than Mac or Windows. For some reason, it has a smaller memory footprint. 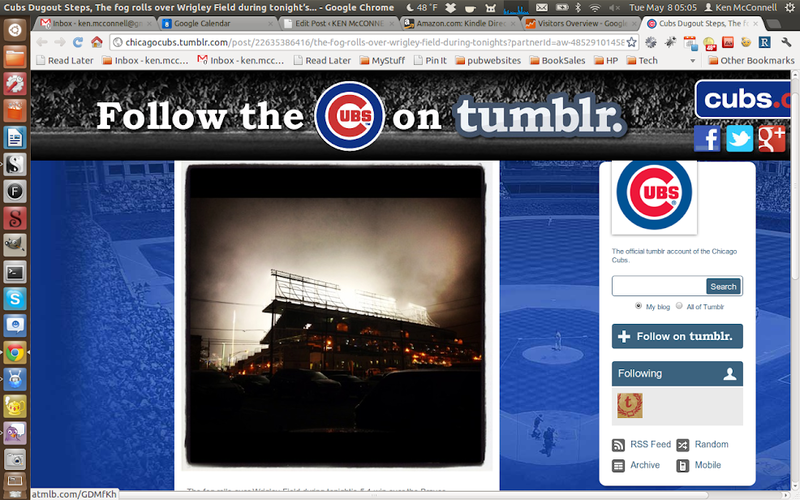 Seriously, the Cubs on Tumblr? That service has jumped the shark man. Here is the new Gimp, showing off it’s single window look. I like. I can’t wait to get some time to play around with the new features in Gimp 2.8. That’s a stock USAF photo of the new F-22. Because I just love airplanes, don’t you know? 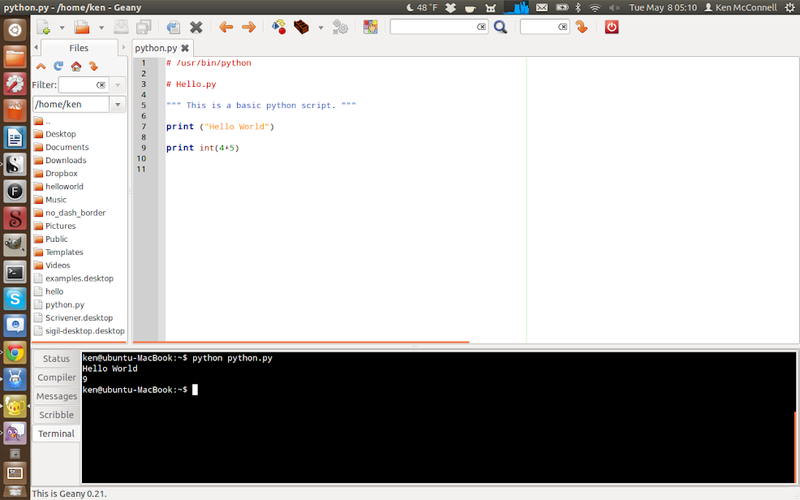 This is Geany, a GTK based IDE for programming. I use it when I mess around with Python. I’ve got my son using it now on the HP Mini. He’s been watching the Khan Academy class on beginning programming. Don’t get me started on why Sal Khan is using a Windows only IDE in the video. I mean come on! Here is Sigil, the Open Source EPUB creator that nobody seems to know about, but that I adore to pieces. 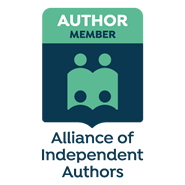 I no longer build my own ebooks, but when I did, or when I need to look at one, Sigil is my go-to program. As you can see, Ubuntu is working just fine for me and the programs I use on Linux. Not saying that it’s for you, but if you’re looking for something different and free, you should consider using Ubuntu. I am therefore going to install it on my computer and keep learning slowly since I have been known to windows since my computer career. Randy, at first I had a similar problem but I noticed that when I installed stuff, it got installed, but…no icon. If that’s what you mean, use the Dash Home, the topmost icon. Once that’s open, click on the icon on the bottom that looks like a bar chart (I’m not sure just what that icon is, it’s the one to the right of the home icon). You’ll see a listing of Installed apps with the ability to show all installed apps by clicking on the “see 119 more results” (or whatever yours says). Or you can type the name of the app in the search bar at the top. If you want the icon on your desktop or the task bar, drag it into place and release. Unfortunately, not all apps will show up there, and if you do a search in a terminal window using “find / -name where’smyapp” then you can create a small script to run it, if it’s not already in your PATH. You might need to do “sudo find / -name where’smyapp | grep where’smyapp” if you get a lot of “Permission denied” results. Max, did you check out KompoZer? I’ve used both Dreamweaver on Windoze and KompoZer on Linux. For me, KompoZer is the closest I’ve found so far. Like Ken says, though, it’s just as easy to code your HTML in a text editor, perhaps Sublime Text, and view the results in a browser. If you need the WYSIWYG editor, KompoZer works. It’s kind of old, though, and I’m sure there are other solutions available now. SeaMonkey and Amaya are two others that come to mind that might be more up to date. After running 10.4 for several years, the switch to 12.4 has not been a very good experience. Is it really progress to regress to columns of Crayola-style icons instead of menus? The desktop looks as though it was designed by a 5 year-old. Several applications insist they are installed, but cannot be found. Ubuntu 12.4 is seriously reduced in form and function, and I am about to delete and either reload 10.4 or leave the community altogether. This is just coming from my experience as a web developer, please don’t be offended by it. But web view is really just a browser window. I always tested my web design on several browsers rather than relying on a single program’s internal view. This was primarily based on the many different rendering styles of the major browsers. Linux programmers have traditionally preferred a text editor and a browser to test with over an IDE. But many former Windows users seem more comfortable with programs like Dreamweaver and Visual Studio. I used to use Dreamweaver on Windows but eventually adapted to using a decent editor and a browser. I no longer even look for equivalents to Dreamweaver. If anyone reading this post has a favorite Dreamweaver substitute, chime in. I’m sure many folks will find it useful. Thanks for commenting Max! Ubuntu is good, but it gave very tough time when I migrated from Windows to Linux (Ubuntu) and needed equivalent of Dreamweaver. There is no tool in Ubuntu that is stable and supports Web Preview like Dreamweaver. Ubuntu with it’s strong South African connection is now the OS of choice in many African schools with the Mark Shuutleworth Foundation sponsoring hardware and educational programs. Now used by more than 20 million users worldwide and by many government institutions in Europe. I have recently got rid of Windows (I’m an anti Microsoft person) the only thing holding be back was a good wysiwyg /HTML web builder with a good editor that could match the Windows based Serif WebPlus software and it finally arrived Qnewb, a fantastic piece of software is now in the Ubuntu apps library for only 19.95USD which is for nothing when compared to Windows rivals. 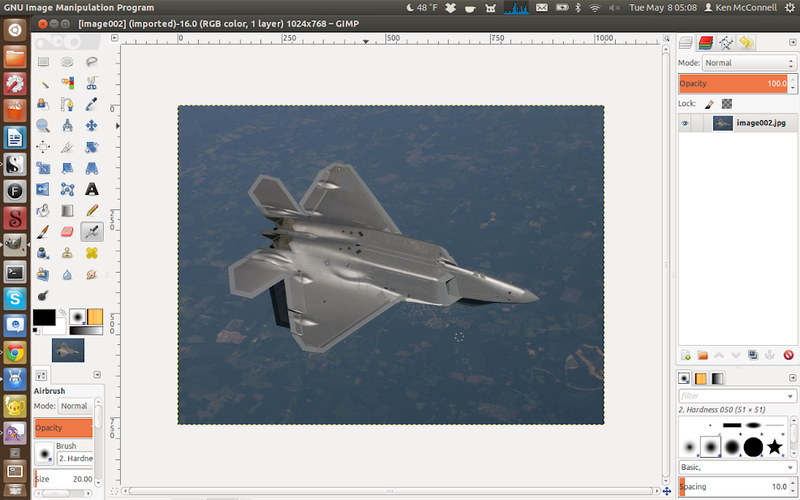 Coupled with Gimp and Xara, one can now create amazing websites. Ritesh – Linux has to be able to work on a greater variety of hardware than any proprietary OS. Sometimes what you have just doesn’t work with the latest version of Ubuntu. Using older versions is okay and something that I have done many times on older hardware. 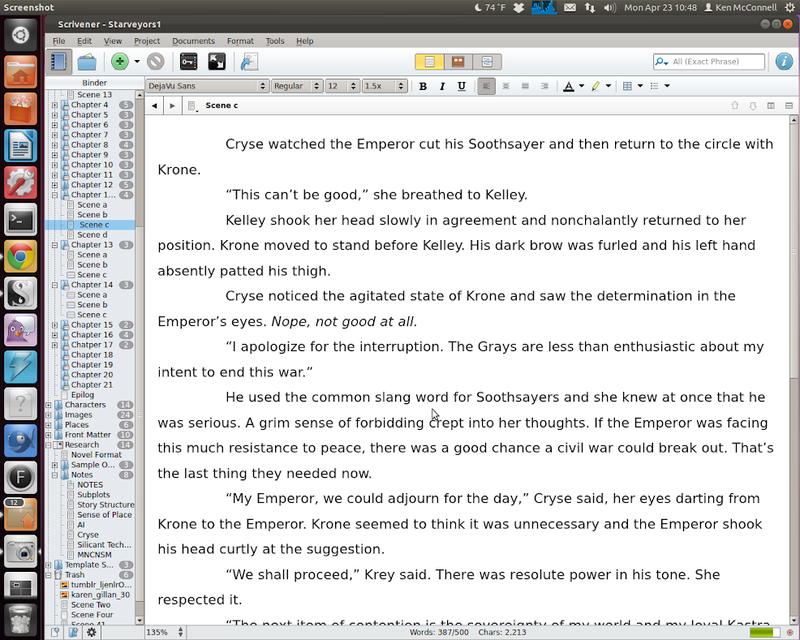 Kelvin – The only reason Scrivener works on Linux is because some people have volunteered to make it do so. Apple will probably never let anyone use their applications on Linux. To be honest, that’s a good thing. I use Amazon’s music service and even Google’s. There are alternatives to iTunes, you just have to have the courage to try them. Jakob – The reason I didn’t buy an HP laptop for running Ubuntu is because HP does not work with the Linux community to ensure their hardware drivers are compatible with Linux. I went with the Dell XPS 13 Ultrabook because Dell gets it. They have drivers that work with Ubuntu on that particular laptop. Do a search for that Dell on this site and you can see how easy it was for me to run Ubuntu on that laptop. love Ubuntu and think that 12.04 is good looking and easy to use. I have just bought an hp folio and have some difficulties, it is not always easy to change hardware with ubuntu. Hi liked your review and love Ubuntu. Recently my teenage daughter moved over to Ubuntu after her hard drive 7 exploded; a cheaper option than installing Windows. She’s getting on well with Ubuntu and loves the software sweet shop. Unfortunately i.tunes doesn’t work, i have downloaded it, using ‘Wine’ but it’s not right. So maybe not all things Apple are compatible. After Install Ubuntu 12.4 LTS into my Desktop System, taking long time to open any Applications. Its boot smartly but when I tried to open any Application is taking long time, if I open more then one Application its dead. On the same desktop with same configuration I use Ubuntu 11 and its working fine. After searching some solution update my Ubuntu 12.4 LTS but its the same. Now I decided to use Ubuntu 11. That’s a good idea for a longer post, Bill. 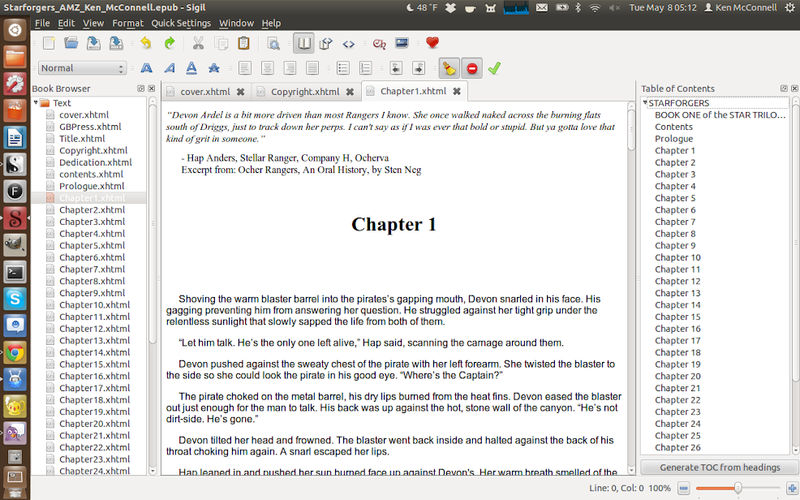 I’ll see if I can show how I use Scrivener with the latest novel-in-progress. I’m sure lots of writers would get something out of an over-the-shoulder walk through. I’m glad Gimp left the option open to use either view for the window mode. There are times like you say that it comes in handy to separate out the various windows. I was one of those that went surfing other Linux distros when Ubuntu 11 came out with Unity. Even though I played around with the other distros, I was waiting for Ubuntu 12.04 to come out in the hopes that I’d find that they had improved Unity to where it was much more user friendly, usable, and configurable. Happily Unity, as you mention, was vastly improved in 12.04. As you know, I returned to Ubuntu. I’m very glad to see the listing of applications you shared. Most of them I already use, but there’s one or two that I plan to look into. I’m ambivalent, myself, about the one window mode of Gimp. When i first heard about it, I wasn’t sure I’d like it, but apparently it was a major request. Having played with it a little, I’m very glad that it’s an option rather than the only way you’re going to get it. I find myself using both modes equally, so far. Switching monitors between a large monitor and the laptop screen, the single window mode is nice to get everything into place quickly and easily. On the large monitor, I like the multiple windows as that lets me make the graphical window full screen for maximum working real estate and a quick click or two gets me to the controls. 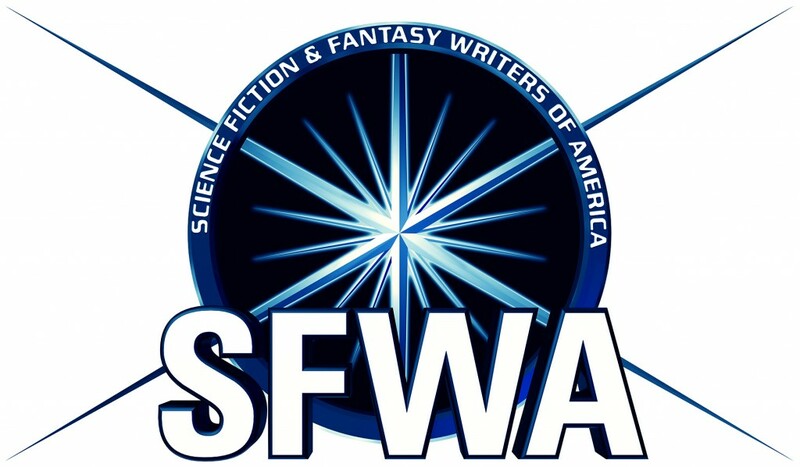 Someday I’d like to see a writeup on you actually using Scrivener. There’s tutorials, write- ups, blogging, but there’s not really anything out there I’m aware of that describes it being used. Something that lets me watch over your shoulder as you use it. Oh, about Sigil, that application nobody uses…I’m another user. Erratically, but I still do use it every so often.